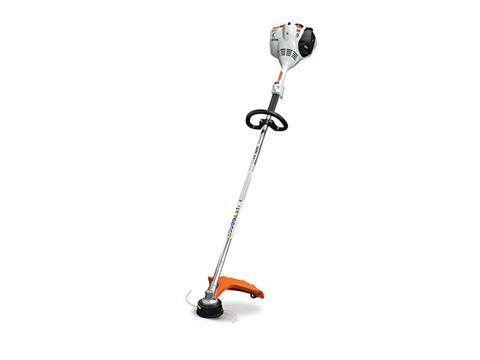 FS 56 RC-E A straight-shaft grass trimmer with a fuel-efficient engine and STIHL Easy2Start™. More power, less emissions. The FS 56 RC-E trimmer features a high-performance, fuel-efficient engine that runs cleaner and smoother and provides about 5% more power than the FS 55 R. When it’s not squeezing every last ounce of performance from its upright fuel tank, this straight-shaft grass trimmer keeps the weeds at bay, thanks to its AUTOCUT® cutting head. This STIHL® trimmer also features our Easy2Start™ technology, making starting nearly effortless. And with its simple, reliable and convenient starting procedure with a momentary stop switch which automatically returns to the start position, this trimmer is always at the ready to get to work. For comfort, performance and maneuverability, this trimmer hits the sweet spot. SUPPORT STRAP: Support strap provides additional support while working. LOOP HANDLE: Loop handle grass trimmers and brushcutters are ideal for trimming between bushes and shrubs and other areas where space is limited. STIHL EASY2START™: The STIHL Easy2Start™ system makes starting STIHL outdoor power tools almost effortless, eliminating the need for a strong pull of the starting cord. This advanced starting system is designed to make starting STIHL products easier. The specific system may vary by model, but in each case, a quick pull overcomes the engine’s compression to minimize the strength and effort required to start. SIMPLIFIED STARTING PROCEDURE: To get started, simply pump the fuel primer, set the choke and pull the starter cord. The built-in stop switch allows the user to turn off the engine with a simple press of the button. When the engine is off, the throttle lock automatically returns to the “start” setting. Your power tool will be ready to be started when you’re ready to get back to work. HEAVY-DUTY CENTRIFUGAL CLUTCH: Is designed to reduce slippage. PROTECTED THROTTLE TRIGGER: Helps prevent damage. LONG-LIFE CYLINDERS: Provide maximum wear life, better cooling and lubrication, more power output. SUPERIOR BALANCE AND DESIGN: Help reduce operator fatigue and make handling easy. FAMILY ENGINE CONCEPT: Includes many interchangeable components across model lines, enabling fast field fixes. AUTOCUT® TRIMMING HEAD: A proven and dependable TapAction™ cutting head. Cutting Swath - 16.5 in.